E. M. Elsheik explains biotic evolution, development through grand quantum biological revolution. Today’s society is endangered by selfishness and violence,” Elsheik says. “Discovery of the Life-Organizing Principle’ contributes to clarifying the essence of this problem and how to transcend it. After decades of research, author and scholar E. M. Elsheik presents his answers to the question, “What is man?” in his philosophical new book, “Discovery of the Life-Organizing Principle: In Search of the Fundamental Laws of Life” (published by iUniverse). Since 1970, Elsheik has been searching – almost obsessively, he admits – to transform the abstract, philosophical ideas about the concept of life into a theory or hypothesis of quantum information fractal field biology. After more than four decades of intense research, Elsheik has identified what he calls a "grand quantum biological revolution", a principle that seeks to unify physics and biology and considers why living systems self-organize, reproduce and evolve. 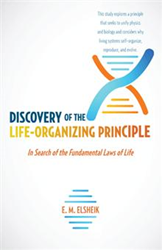 “Discovery of the Life-Organizing Principle” outlines this unified theory of life that seeks to explain biotic evolution and development. Elsheik’s principle unifies physics and biology by extending the concept of matter, and reconciles biology with human sciences by extending Darwinism. E. M. Elsheik has a master’s degree in applied mathematics from University of Khartoum, Sudan. He was the head of the math department at Altahadi University, Serit, Libya for more than 10 years and served as executive secretary for Sudan National Academy of Science for two years. He was a contributor at the Third International Congress of Mathematical Biology held in Chile in 1988 and at San Diego’s 2004 Expanding Human Consciousness Conference. More information is available at http://www.lifeprinciple.com.